One of the SHRMStore’s most popular legal compliance products, the HR Comply state-specific and federal employment law manuals are now uniquely available as a web-based service exclusively. This comprehensive web-based tool replaces the former print-version of the manual. It is updated regularly to keep you in compliance with the ever-changing state and federal employment laws. It provides understanding and communication of the rights and responsibilities of employers and employees within our complex federal/state legal system. The state-specific and federal information provides in-depth, plain-language explanations of hundreds of critical compliance topics, timely updates on the constantly changing compliance landscape, instant access to model forms and policies, and exceptional HR management and training tools. Capacity to filter topic content by jurisdiction and type: commentary, forms, sample policies, and tools. Enriched graphics, colors, and formatting advance ease of reading. Multiple alternative navigation tools, including linked topic index. Quickly identify new and recently updated content. Updated sections on benefits, including retirement and pension, health and welfare plans, and a guide to the Patient Protection and Affordable Care Act ("health care reform"). Reduce risks. Find answers quickly. Stay in compliance with HR Compliance Basic. 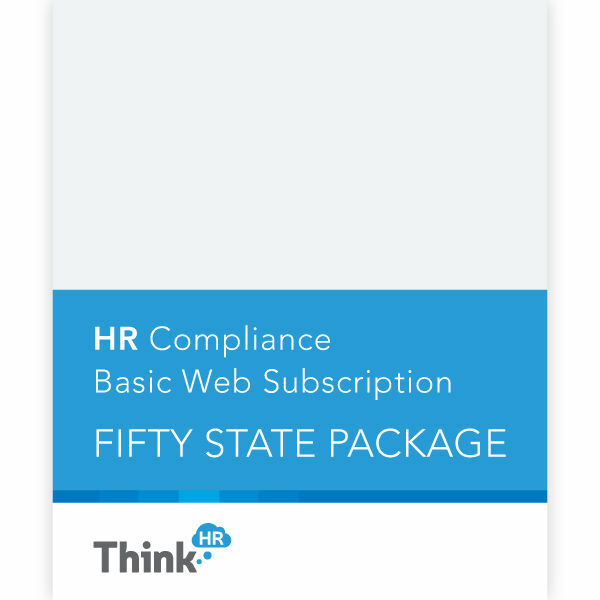 When you purchase HR Compliance, your web access will be emailed to you from HRComplianceBasic@thinkhr.com or services@thinkhr.com. Save when you purchase the Fifty-State Package! I am very disappointed with this product. Although the content is ok once you find it, the navigation is terrible. Sorting doesn't properly work. I was hoping to get alerts as new laws are passed, which doesnt happen. I have 28 states to work with, so looking up each individually wondering if there are changes is not what I was hoping for. Clicking the option for "most recent" doesnt produce the most recent posts.